Written by steph stevens on Friday, January 18th, 2013 at 2:30pm. 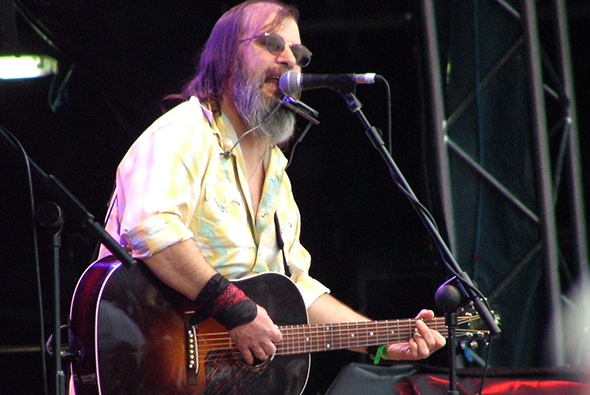 Steve Earle isn’t exactly a household name, but with a music career as prolific as his has been, he should be. Earle has worked with a wide range of artists including (but definitely not limited to) Patti Smith, Johnny Cash, and Bruce Springsteen. He’s received 14 Grammy nominations and won three awards, and he was nominated for an Emmy for his song “This City,” written for HBO’s soon-to-wrap post-Katrina production Tremé. At the Belly Up on January 13, Earle took to the stage solo, performing to a standing-room-only full house and skillfully spanning nearly 40 years worth of songwriting in a solid two-hour show. The thing that’s key to Earle’s music is the absolute authenticity with which he performs; he is a “folk” artist in the best sense of the word. Song after song, you can’t help but feel connected, because he’s singing about universal desires, tragedies, and triumphs. Earle is a consummate storyteller, and he shared a number of awe-inspiring tales about performing with various musical legends like Pete Seeger and the trials and tribulations of getting (and staying) sober, all while staying firmly grounded in the social and political realities of our time. Folk is an often under-appreciated genre, and Steve Earle brings a constantly renewed freshness to it with his sincerity and passion. He’s due to come back to our fair city this summer (with a full band this time) and it should be a must-see show. He’s worth the ticket price for the battle-scarred, music legend stories alone.